While in Blue Hill, Maine, I received a call from Alan at Own Guru Records. He had a promo copy of Allen Ginsberg’s Lion for Real. By the time I called back, he had sold it to a particularly attractive French tourist. Vous comprenez, non? Oui, but only because I already owned a copy. Alan knew about Blue Hill from scanning through FM stations on his travels. He hit upon 89.9 FM (WERU), the local alternative station, and was drawn like a moth to a flame to this small community with peninsulas full of artists and aging hippies. He urged me to walk around Echo Lake in nearby Acadia National Park assuring me that there were psychedelic mushrooms along the shores. I was doubtful, but given all the survivors of Kerouac’s rucksack revolution that wander through Acadia I be mistaken. It has to be more than the stunning vistas that attract the lonesome travelers walking away from the wreckage of the counterculture. Maybe there are also visions in them thar hills. As he hung up, Alan turned me on to a small bookstore outside of Bass Harbor called Rue Cottage Books. Years ago, he had some luck finding little magazines there. He thought it was worth a stop. I decided to take his advice, and I am glad I did. Taking Route 3 on to Mount Desert, bear to the left and stay on Route 102. 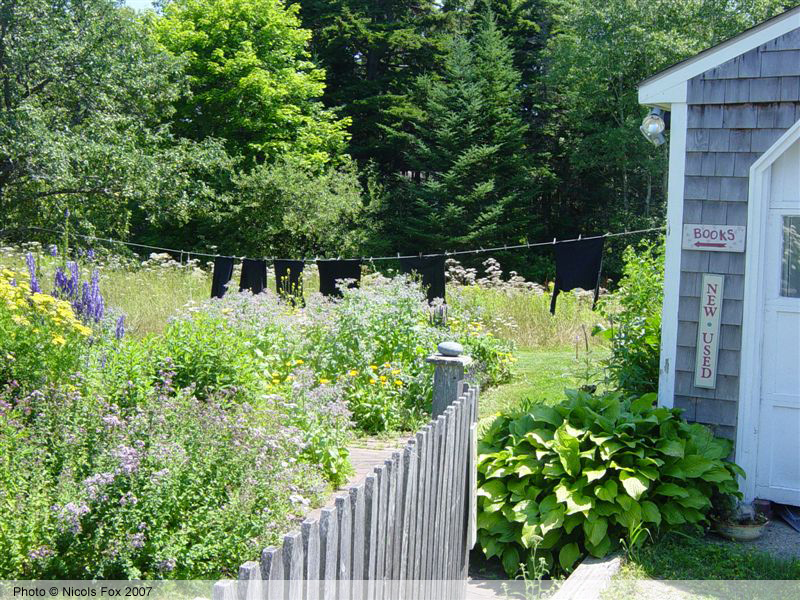 Eventually you will wind your way to the small, seaside community of Bass Harbor. 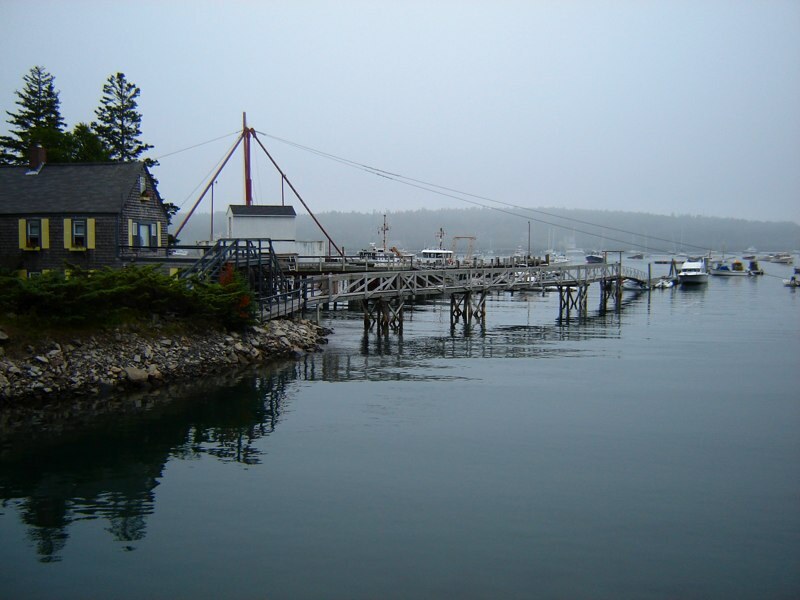 Most people stay to the right off of Route 3 and explore the Eastern part of Mount Desert highlighted by Bar Harbor. Take the road less traveled. The western part of the island is far less crowded and features some incredible scenery. I find the towns of Bass Harbor, Bernard, Somesville and Southwest Harbor far superior to the more tourist-focused Bar Harbor. Bass Harbor’s main tourist attraction is a small, functioning lighthouse on the outskirts of town. 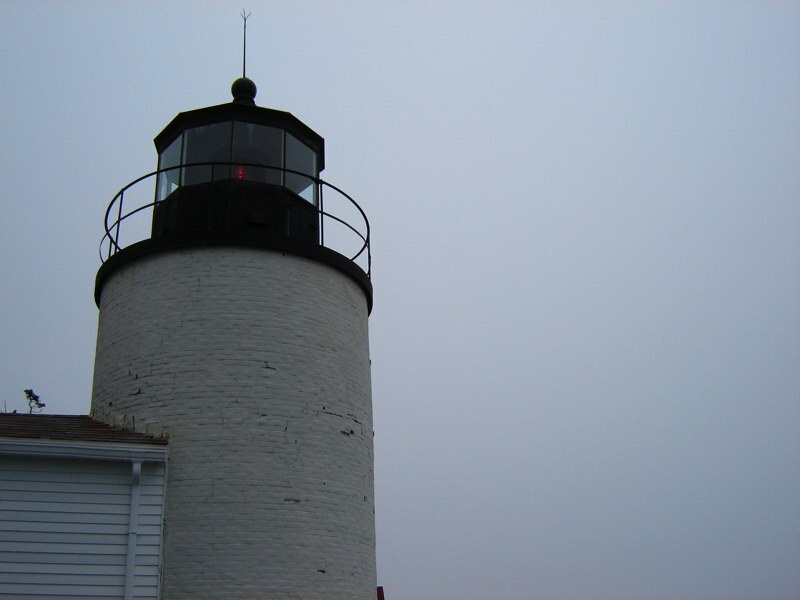 On the day I visited, there was a dense fog that made seeing 100 feet a challenge, so given all the working and pleasure boats in the area, I quickly understood the need for a lighthouse. Rue Cottage Books used to be located in Southwest Harbor at a larger location, but owner Nicols Fox downsized and moved back to where the store first took root. The bookstore operates out of Fox’s home with a small garage taking some of the overflow. The house sits at a bend in the road. You just pull into her driveway and worry about the tricky business of getting back on the road for later. I walked into the store and was warmly greeted by Fox who moved to Maine from McLean, Virginia over two decades ago. Searching for a new direction in her life, she found that the road led north into Vacationland. Based on Alan’s previous experience, I focused on little magazines and started determinedly hunting through the small room. Book collecting law: If the key to acquiring a book collection is focus, focus, focus, the key to finding those books is to wander freely with an open mind. One of the joys of browsing a used and rare bookstore is never knowing what you are going to find. Putting blinders on and searching for one book robs you of that joy. The hidden treasures that will fill out your collection nicely will remain hidden. A more narrow and focused approach proves necessary when searching the daunting immensity of internet sites, such as Abebooks, eBay, or Addall. As a result of the intensity of my focus, I was initially disappointed with Rue Cottage Books. The promised little magazines were not there. I got a New Direction printing of Jules Supervielle with translations by Kenneth Rexroth and Denise Levertov and prepared to move on. Fox advised me to check out the garage for the bargain books. Without much hope, I walked in and found a copy of Henry Miller’s Nexus. Miller was on my mind due to the RealityStudio piece on Miller and Burroughs. In addition, I found copies of Matthew Arnold’s Culture and Anarchy and Herbert Marcuse’s One Dimensional Man. I found the Arnold and Marcuse books sitting side by side, which is appropriate. Both books provide an anxiety-filled cultural analysis in light of the Industrial Revolution. Arnold, along with Thomas Carlyle, was one of the quintessential Victorian critics. Culture and Anarchy was written at the height of the Industrial Age. Marcuse was one of the major philosophers of the counterculture. One Dimensional Man examines the cultural affects of the Post-Industrial Age with the military industrial complex, the emerging global economy, and the electronic revolution firmly in mind. I had unwittingly uncovered the (not so, it turns out) hidden pleasure of Rue Cottage Books: Fox’s fascination with the intersection of culture and technology. Rue Cottage houses a small shelf of recent releases and reissues off to the side of the main room. While my copies of Arnold, Miller, and Marcuse were being rung up, I found a copy of Tolstoy’s Dictaphone: Technology and the Muse, edited by Sven Birkerts. This collection of essays by several leading writers expands on Birkerts’ mediations on the repercussion of the Digital Age. In Dictaphone, a full range of communication and printing technologies are examined with an eye to their impact on literature and the literary imagination. Literature and technology formed the focus of my brief sojourn in graduate school at Iowa, and one of the most memorable experiences of that brief time was a reading and discussion by Birkets at the legendary Prairie Lights bookstore. Turns out that Birkerts was a major influence on Nicols Fox. She pointed me towards Marshall McLuhan’s The Gutenberg Galaxy and then suggested that I might be interested in her own thoughts on literature and technology: Against the Machine: The Hidden Luddite Tradition in Literature, Art and Individual Lives. I was and am. All three books are important background reading for understanding the philosophical and intellectual cross currents of the alternative publishing that I collect and write about. Small press, artist books, letterpress, mimeo, DIY zines. Flipping through Fox’s book, there are long chapters on William Blake and William Morris, two of the forefathers of the alternative press in the 20th Century. The mimeo revolution of the post-WWII era builds on the same Luddite tradition outlined in Fox’s book. This tradition expresses a desire to take the means of production and distribution into one’s own hands and to flourish as an artist despite the neglect of, in defiance of, or in seclusion from the machinery of mainstream mechanical reproduction. Given the Luddite tendencies and eco-mindedness of many of the Beats — think Gary Snyder and Kerouac — I was surprised there was not a full chapter on them in the book. Take this oft-quoted section of The Dharma Bums. Kerouac through Japhy Ryder (Snyder) writes of “a world full of rucksack wanderers, Dharma Bums refusing to subscribe to the general demand that they consume production and therefore have to work for the privilege of consuming all that stuff they really don’t want anyway such as refrigerators, TV sets, cars, at least new fancy cars, certain hair oils and deodorants and general junk you always see a week later in the junk anyway, all of them imprisoned in a system of work, produce consume, work, produce, consume.” Fox’s attentions are directed elsewhere, but I would love to read her on this topic as well. These books were considerably more expensive, and I was surprised to learn that Fox took credit cards and sold books on the internet given her Luddite sympathies. Her dryer died, and she never replaced it. She does not have cable TV and only keeps a television for emergency information. Yet to operate as a bookseller, the computer and internet are necessary evils. That got us talking about the revolution in the book trade ushered in by the Internet. Her experiences paralleled some general trends that may now have acquired the status of laws. With the introduction of sites like Abebooks, eBay and Amazon, the price of the general used and rare stock of a brick and mortar bookstore has dropped significantly. Fox remembered reducing prices throughout her shop as she got online. That said prices have increased drastically for the truly rare and unusual. Holy Grail items, like the Digit Junkie, that one thought may have a ceiling keep soaring upwards if one happens to turn up. In addition, the internet opened markets to booksellers that they never knew existed. The seemingly most mundane pamphlet or instruction manual that would have sat tucked away on a shelf has a buyer out there. The internet makes joining the two parties easier than ever. That said Fox missed the personal, human touches of the pre-Internet days. An emailed note of thanks for a sale lacks the warmth of a note on Rue Cottage stationery. Handmade stationery adorned with Fox’s own script. She still includes bookmarks with internet purchases. I assured her that she is not alone. As I have written, the pendulum is swinging back away from the impersonal digital sale. Book fairs and catalogs are on the rise. Virtual bookstores are being personalized as well. There is now an effort to make the site less a listing of books and more of an interactive experience. More pictures, more updated stock, more information on the books than prices and condition, more general book news, and blogs. The idea is to create an identity and sense of place like at a brick and mortar store. The pre-fab webpages made by one designing company like a digital Levittown are being remodeled. Case in point is Harper’s Books in East Hampton, NY. I just received an email from them announcing a revamped webpage. Some of the above trends have been incorporated into the redesign like a blog. Browsing bookstores in Maine provided more unexpected finds and more memories than a year full of eBay and Abebook searching. Yet as I mentioned, the internet with its focused searching and quick results makes one forget the pleasures of spending a few hours with a room full of books and an interesting, knowledgeable bookseller. Some of the most valuable things you find in a bookstore are not on the shelves. This gets back to the idea of the bookstore’s role in a community. The brick and mortar store, that from all accounts is dying, holds a permanent place in creative circles and the population at large. The internet can not completely fill this void. It lacks a physical presence: a smell, a taste, tactility. All experience does not generate from sound and sight. As my girlfriend and I left Rue Cottage Books, Fox suggested we stop by Scott Nearing’s place on Cape Rosier. Nearing and his wife Helen appear in Fox’s book on the Luddite tradition. 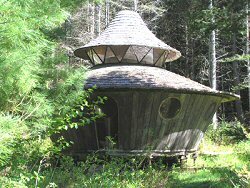 The Nearings were one of the founding families of the Eco-Movement. They moved to Maine to put their Good Life philosophies into practice. Thousands of people followed them back to the land and several made the trek down the unpaved road to the Cape Rosier retreat near Brooksville. Scott committed suicide at the age of 100, and Helen died some years later in her 90s. The Nearing house and grounds are now open to the public. Guided tours are available lead by handpicked couple-in-residence that lives according to the Nearings’ principles. We drove out on a Wednesday and unfortunately that is the day the residents take a break from the curious. It was closed. I had hoped to see the Nearings’ library that is still on the premises and open for inspection. I have been told it is heavy on economics, but I hoped to see a copy of The Dharma Bums or Turtle Island alongside titles representing “the dismal science.” A room full of books be it a library or a bookstore can inspire a mind and change the world. The internet is in the process of finding ways to recreate this sense of physical space and presence in order to achieve a similar lasting power over minds, hearts and souls. Written by Jed Birmingham and published by RealityStudio on 21 August 2007. It’s hard to imagine that folks will still find this fascinating article. (one tends to find oneself fascinating, I admit). While I sell a few books now and then, sadly, Rue Cottage Books is no longer open. In fact, I sold that lovely cottage and now live even further Down East. Illness and age have taken their toll and Mount Desert Island is too full of tourists for me. I have those bookstore signs still and feel quite nostalgic reading the observations about our encounter. I only wish I’d started Rue Cottage Books earlier so that I could have had a longer time as a bookseller. It was the best part of my wandering life. No, wait. Writing books–researching, thinking–was a wonderful period as well. I’m still writing–just not completing–which is obviously an essential part of writing. But I find I have vanished from Wikipedia–fame is fleeting–and even my own website seems to have disappeared when I wasn’t paying attention. There’s something amusing about that–I think.